United will kick-off their campaign against Tupapa Maraenga FC of Cook Islands in the second game of the opening day on Tuesday 1st of May, at Loto Tonga Soka Center at Valungofulu. 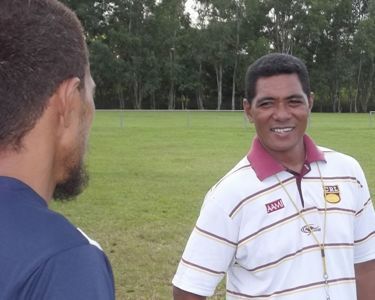 With less than 24 hours to go, Polovili is confident his team has done enough to win. “In the past few days we turned our focus to our game plans and playing structures while boosting our team work ability and everything is going to plan and I guess we are fit enough to be competitive and to win.” he added. United will feature a mixture of young talented players with veterans from the past. Leading upfront will be striker Lafaele Moala, who has been a regular international representative since 2003. Moala will play alongside youngsters from the National Men’s U-23 team and veterans like former rep captain Kilifi Uele and former Fijian flyer Lui Muavesi. “We have all the weapon we need. We have speed, skills and strength both upfront and our backs too. What is left now is for us to stick to our game plan and I’m sure we cab be unbeatable.” Moala said. The hosts open their campaign against Cook Islands outfit Tupapa Maraenga on Tuesday before meeting American Samoa’s Pago Youth on Thursday and Kiwi from Samoa on Saturday. The winner of the round robin will go on to meet Mont-Dore on May 8 for a place in the 2013 O-League. United has been dominating Tonga Football Association’s Major League and earned the right to fight for a spot in Oceania’s most premium club competition after thrashing Ma’ufanga Marist FC in the Premier Division final last year.